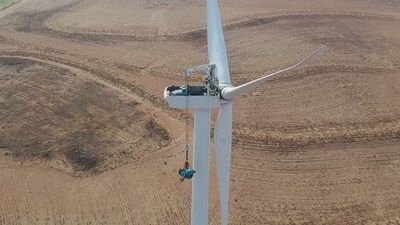 AUSTIN, Texas, Dec. 6, 2018 /PRNewswire/ -- E.ON Energy Services (EES) announced today it has reached a significant milestone with the 100th deployment of its self-lifting crane on a maintenance job at the Loraine Wind Farm, near Sweetwater, Texas. "Because of EON's commitment to safe, cutting edge technology E.ON Energy Services was able to bring a lower cost solution to wind asset owners in the North American market," said Kurt Anderson, Vice President of Business Development for EON Energy Services. "The resulting benefit to our customers has proven to be a game changer for EES." Continuous Innovation is a critical driver to the EES approach and use of the self-hoisting crane has helped customers cut costs up to 20 percent by reducng crane related costs and downtime. To get the most out of this equipment, EES has partnered with E.ON's Major Components Team, one of the best in the business at major repairs and replacements for gearboxes, generators, bearings, and rotors. "E.ON's decision to deploy a self-erecting crane in North America was truly transformational for E.ON Energy Services," said Kent Thornqvist, E.ON Vice President of Large Correctives. "Our ability to leverage the strength and capabilities of the EON organization allowed E.ON Energy Services to offer this cost saving approach to asset owners across the country." EES's self-hoisting crane can work anywhere there is a usable road, requires no crane pad, comes in a single container and has a higher cut out wind speed than a traditional crane. In addition, EES is able to leverage E.ON's global reach, applying new technologies and methods to improve fleet performance and profitability. E.ON is an international investor-owned energy company, focusing entirely on energy networks, customer solutions and renewables. In the 2017 financial year, more than 40,000 employees from 90 nations generated sales of around $42 billion. Around 32 million customers purchase gas and electricity from E.ON. Within the global renewables segment E.ON is a leading company. The company has already invested more than $12 billion and operates nearly 5.4 gigawatts of renewable capacity. E.ON Energy Services (EES) is a wholly-owned subsidiary of E.ON North America and provides asset management, BOP, energy management and Operations and Maintenance services to third-party customers. EES has more than 20 sites under contract in North America and manages more than 2.5 GW of assets through its state-of-the-art Renewables Operation Center in Austin, Texas.